Hot Sony Deals: now you can save up to $900 + 4% Rewards on Sony cameras, lenses and accessories at B&H, Adorama. 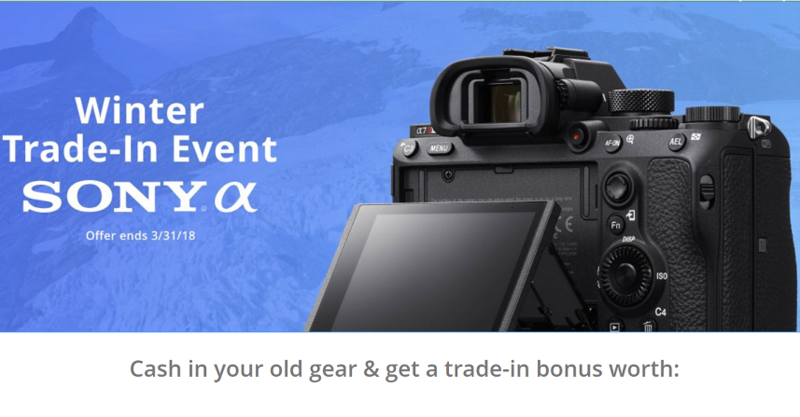 In addition, Sony launches their Winter Trade-In event at B&H, Adorama. Offer ends on March 31, 2018. $500 off on Sony a7II body: $1,098 at Amazon, B&H, Adorama. $200 off on Sony a7 with 28-70mm Lens: $998 at Amazon, B&H, Adorama. $100 off on Sony a6500 body: $1,298 at Amazon, B&H, Adorama.